It takes only five minutes to cook eggs (do not add salt if you are eating with bacon). You can add some shredded cheese on top of eggs. It is so easy to stir-fry a vegetable dish to eat with the egg dish. Just wash and cut up veggies and cook it with diced baked potatoes with garlic and add salt and pepper in the end. Please do not use frozen vegetables. A lot of people in the United States use frozen vegetables. Have we ever wondered why kids don’t like vegetables. If you use fresh vegetables, you will like to eat them. Frozen vegetables are reasons why people don’t like to eat veggies. Make sure don’t overcook vegetables. It should not take longer than 4 or 5 min. I think it tastes the best when it retains its original color and slightly crunchy inside. 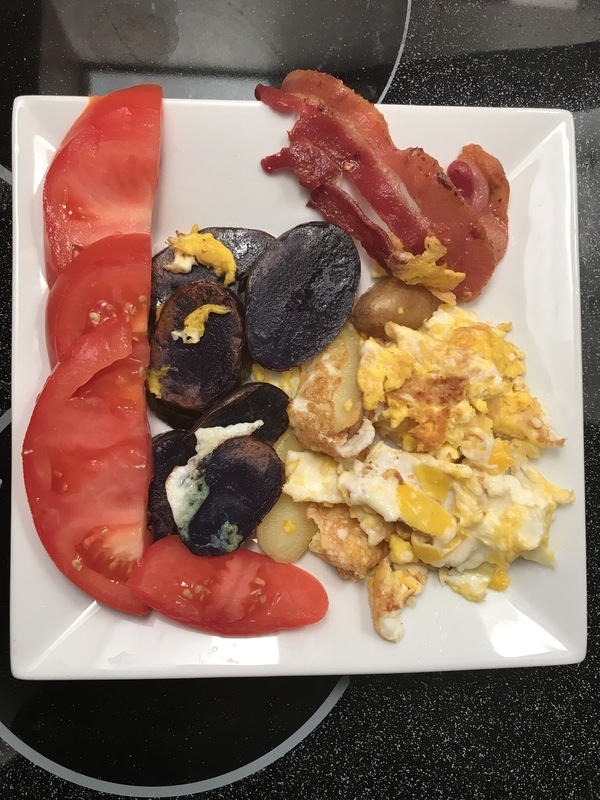 You can also simply add fresh pieces of tomato and heat up your baked potatoes (preferably in a wide variety of color) and fresh fruits to the egg dish. Before you eat a bagel and coffee with cream and sugar for breakfast, conjure up an image that your body is going to be flushed with a surge of sugar. Your body will thank you if you treat it with a diet rich in vitamins, minerals, proteins, complex carbohydrates, and fiber-rich diet. There is no excuse about time. It will only take us 10 minutes to prepare a healthy breakfast like this, if we bake the potatoes before hand. Breakfasts will take even less minutes if we hard boil the eggs the night before.